The other night I spoke at a 360 VR video (Virtual Reality) event in San Francisco at 500 Startups about Immersive Storytelling for Mobile VR. Ulla Engestrom, Founder and CEO of ThingLink, produced the event. ThingLink is evolving from image and video annotation to 360º content with their new ‘VR Editor’. Ulla shared some excellent business use cases, engaging 360 VR video storytelling insights, and live demos on how annotating 360º images and 360 VR video will work. Immersive storytelling in Mobile VR talk with Kirstin Miller and Steven Poe. I was co-speaking with the Kirstin Miller, Executive Director of Ecocity Builders, about a new educational 360 VR video tour project being developed about Ecocities, and how we are approaching some of the 360º storytelling hurtles in this new visual media format. Let me give you a little background story first. Ecocity Builders is working on a technology platform called Urbinsight Project that is based on crowdsourced data collection of resources around the world. Citizens collect the data and upload to the platform. Ecocity Builders then works their data visualization magic and supplies city planners and industry leaders with data sets never seen before. These data visualizations then help plan and build sustainable ecocites that are better for citizens, reduce resource depletion, and help sustain the surrounding natural systems. This is a triple bottom line solution. Given the triple bottom line benefits of the Video Explainer for Urbinsight platform and the opportunity to direct the production of a 360 VR video classroom and I’m all in. The goal of the multi-city virtual tour is to educate about the Ecocity process, and to engage/convert viewers to become contributors to the data collection. The more data collected the more value the Urbinsight platform can provide to city planners and industry leaders. 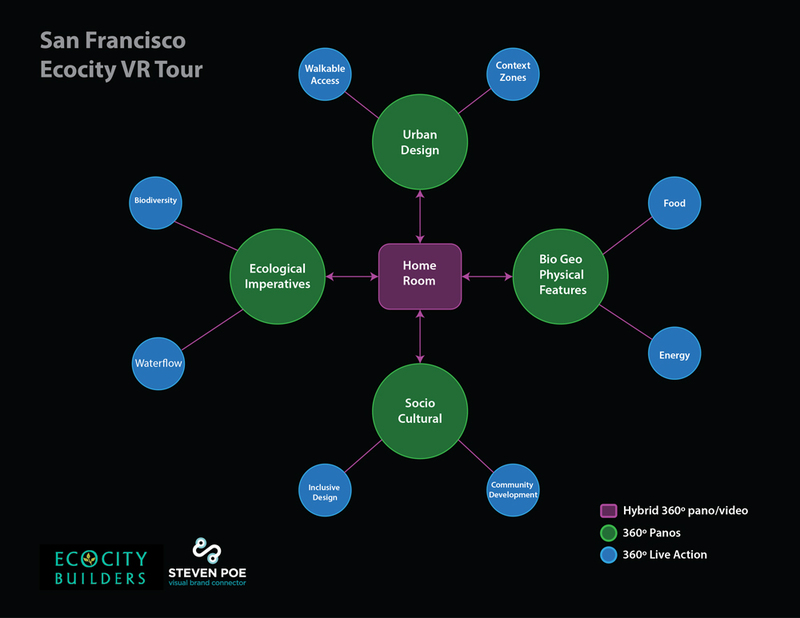 The Immersive Storytelling for Mobile VR event was the first public showcase of the EcocityVR project. 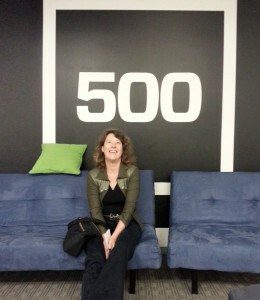 Kirstin turned heads with the history of Ecocity Builders and the objectives of the Urbinsight platform, and I spoke about live action 360 movie making. I was the only speaker that night to demo a live project in front of a savy VR group. Yikes. After hearing myself speak, and listening deeply to the other talks and all the excellent questions it’s really clear that we’re all just figuring this V360 R Filmmaking process out. The standard ways that videographers use camera cuts, switching views, zooming in/out, panning the camera, is all up in the air. The visual storytelling tools that worked for decades within a rectangle are not going to work well with the VR platform. The content of the story is still king. Our team is spending double the normal time in script research and development to make sure that we are using actor movement and narrative to direct the viewer around the scene. I believe that with really good spatial 3D audio recording/rendering, and well planned narrative movement it doesn’t matter where the viewer is looking within the sphere. The message will be clear anywhere in the sphere. Map for each Ecocity pillar within the global virtual reality tour. The Ecocity educational VR tour will also have multiple pieces of content within each 360 VR video sphere, so it’s possible to have multiple immersive learning experiences. I’m going with the approach to 360 VR video production that gives up control to the viewer. Trying to hold on to the previous responsibility of ‘movie director’ too tightly doesn’t work in 360 degree video. It’s an immersive experience. Just like in physical analog life no two people will have exactly the same experience in the exact same place and time. I came away from the other night feeling the excitement of everyone working in live action VR. I love the unknown and creating compelling visuals from new discoveries. What’s really clear is that what VR is going to become is unknown today and that everyone working on live action VR is developing a new visual language.